Two weeks in Rio, of which one week Carnaval so that doesn’t really count as a week, already learned me a lot about a drastically changing everyday life in this marvellous city. As the UPPs (the pacifying police) are my object of study I am of course referring to the changes in relation to this pacification project. However, the general idea of “organising the city” goes way beyond the pacification of the favelas. I haven’t yet had the time to make up my mind, to think about the things I hear and see and to draw relevant conclusions from the information I got. That’s why I am writing this blog. The first days I was staying at a friend’s place in Ipanema – Zona Sul, the elitist, touristy and rich part of the city. He told me how the city has changed in the last couple of years. Not only had violence decreased drastically and was Rio becoming much safer, the city increasingly becomes “organised”. I used to like the Brazilian bus driver’s mentality because they let you in the bus even when there’s no bus stop. They wait for you when you’re late and running to get the bus that is about to leave. Today, they don’t do that anymore. They have a strict time schedule to stick to. Of course, for the public transport system to work this is necessary. Another situation was yesterday when I was waiting for my friend to pick me up from the subway station. It took a little while so I was walking around the station, kind of bored. This guy who was selling home made coconut candy came to me and gave me one, to try. I liked it and bought some and we started chatting. He told me how he got kicked out of another subway station by the guards as he didn’t have a licence to sell food. Up until recently he didn’t need such a licence. The same goes for vendors of snacks and beer walking down Ipanema and Copacabana beach. And the “ugly” beach stands selling caipirinhas, beer and coconut water are replaced by cleaner and better looking bars with terraces and toilets. Places that sell food and drinks must provide bathrooms as well. Two Germans I met told me how they were having a sandwich in the botanic garden when a guard politely asked them to have their picnic at the “picnic area”. They complained: “but that’s what we use to like about Brazil”. These are small, but in my view, significant changes in the mentality of a “País Tropical”. Some people like it: “finally our country starts to function”, others don’t: “a country has to be disorganised, we should not take Europe as an example”. The UPP police and the “Peace Forces” are other examples of the organisation of places considered “disorganised” in order to increase security and order in the city. Some examples of changes in the pacified favelas are an elevator in Cantagalo. Those favela residents living at the top of the hill no longer need to climb the endless stairs (Note that favelas are usually built on hills). 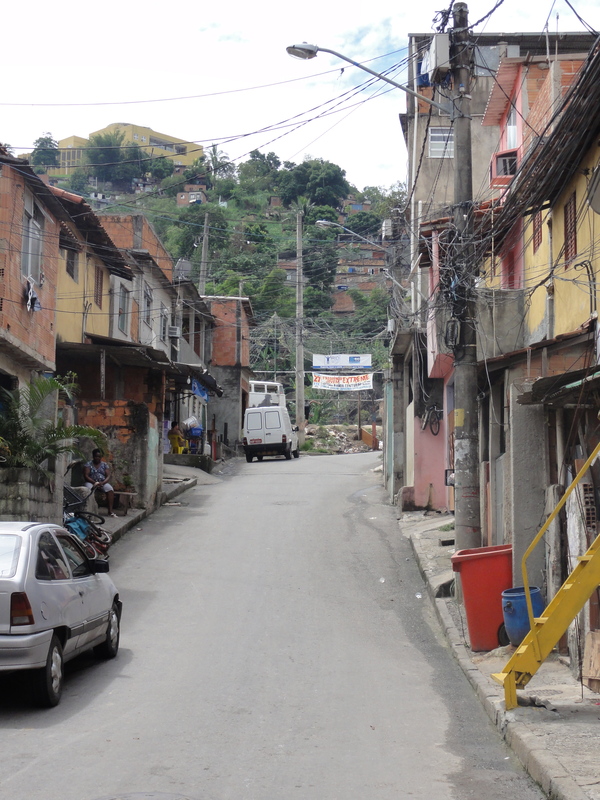 In Providência, down town, a resident told me that they want to construct a little train that goes up the hill. 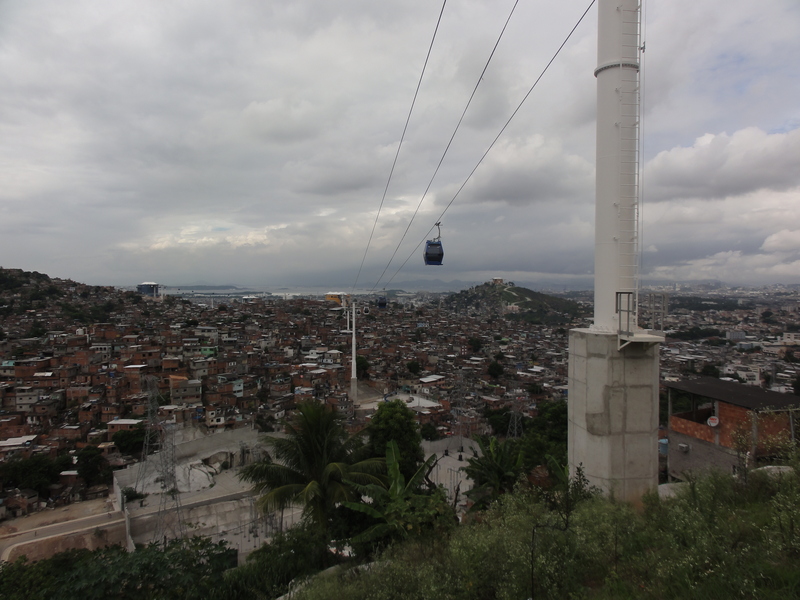 In Complexo do Alemão, the complex of 14 communities that has been occupied since November last year they built a cable car connecting these communities. In some cases houses have to make way for these installations. Also, houses at risk of collapsing are demolished. The residents of these houses are replaced to new apartments blocks. This all results in some contrasting architectural cases. Big colourful and new buildings right next to simple and small houses or sometimes even huts. The above I found particularly interesting because I came to Brazil to investigate the UPP in terms of territoriality and the claiming of these areas by the state. The Brazilian state has been absent in these communities for decades and now tries to obtain power. Through “pacification” these favelas can and will be organised, which will allow the inclusion of these communities into the bureaucratic processes of the state. Interesting, I think, is how the state does this. What new rules and processes are used by the state in this attempt to increase power and control over these areas? In this light, the above examples show how this process is going on in the entire city, and not only in the pacified favelas. The latter are part of and reflect a larger process of organisation. The the coming weeks I will go deeper into the changes and consequences of the pacification. What does it mean? What does it change? How does the pacification of these particular areas paves the way for development?